Our wedding anniversary is in October, and last year, we decided that one day wasn’t going to be nearly enough to celebrate not only reaching our 14th year, but all the love we had found in just the few months prior. We began planning far in advance, and it just so happened that, while our actual date was on a Wednesday, there were events on both the weekends before and after that we wanted to do anyway. The fact that they book-ended the week of our anniversary was just the excuse we needed to go all out. Our anniversary week – which actually ended up lasting 9 days – began in St. Louis the Saturday before. We were going to be in the Halloween 10K race that I wrote about yesterday, and it was on the Sunday morning before our anniversary. Since it was to be early in the morning, and in St. Louis, we went up the day before and got a hotel room for the night. We spend a lot of time in St. Louis, and try to go up there for at least a day trip once a month. There is an Italian community there called “The Hill,” and it was what brought us to St. Louis the first time we ever visited. We eat in the restaurants there and my wife, who is Italian, shops in the family owned grocery stores and bakeries. It’s as close as you can get to being in the old country around here, and we both love it. We also enjoy Forest Park, which is larger than New York’s Central Park. It hosts the St. Louis Zoo, The Art Museum, The History Museum, miles of running and cycling trails, an outdoor skating rink in the winter, and much more. Most of the attractions are free, and the scenery is very beautiful. The day in St. Louis was purely for enjoying ourselves. We picked up our race packets in the afternoon, but other than that, nothing was scheduled. It was just a day for the two of us to spend in any way we wished. It was the kickoff day for the restoration tour’s week-long anniversary celebration, and we were spending it with the person we loved, in a place we loved. The hotel we were staying in had a free hot food bar in the evening, so we took advantage of that even though it wasn’t the type of stuff we usually ate. They also had an indoor/outdoor pool and the weather was actually nice enough to lay out in the sun for a while. I had bought my wife a new bathing suit and was glad that she got to wear it. She did get in a bit of trouble in the hot tub for calling other people’s kids “critters,” but no real harm was done. In the morning, it was fun to put on our costumes and go down to breakfast at the hotel. Naturally, it sparked a lot of conversation, seeing two people wearing huge quarters. We got some pictures taken, shared a little bit of what was going on, and headed downtown for the race. I knew that my knee might not hold up, but I hoped it would. The race wound around downtown, went through the grounds of the Anheuser Busch plant, almost took us into Busch Stadium, and provided great views of the Arch and the Mississippi River. Some of the costumes were fantastic. There was a zombie, Two people dressed as peace and quiet (a hippie and a mime), when pigs fly (you’ll just have to imagine), Gumby, a praying mantis in a cage, and too many others to mention here. We didn’t win any of the prizes, but we had a great time hanging around and seeing it all. “Definitely,” he told me. “You guys are one. You’re opposite sides of the same coin.” I loved that phrase. I actually told my wife that he said that soon afterward, but I didn’t think she had really paid any attention to it. In fact, I forgot all about it until she brought it up during the restoration tour. Right after we got back together, I completed my first triathlon, and my wife was training for her first full marathon. Once the triathlon was over, I was looking for a new challenge, and we decided to train for some 10K races. There were two in October – one in Springfield near our loft, and one in St. Louis close to our anniversary. When we looked into the Halloween 10K in St, Louis, we found out that it’s not just a race. It’s a fun event where many people run in costumes, there are props and Halloween themed scenes along the route, and a costume contest after the race. We knew we wanted to be part of it, and we knew we wanted to run in costumes, but we didn’t know what to dress up as. We kicked around different ideas, but nothing really stood out. 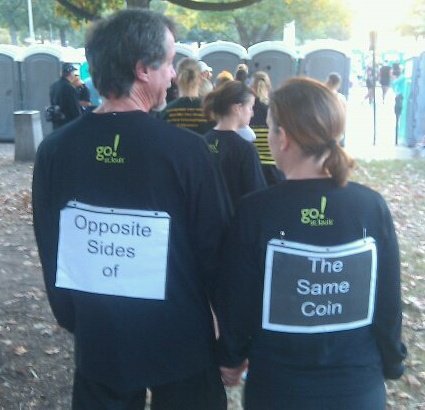 Then one day, my wife said, “Why don’t we go as opposite sides of the same coin?” I was thrilled that she had remembered that and still thought about it, but I wasn’t sure how you could make a costume out of that. I asked her, and as always, she had a great idea. We cut out circles of cardboard and painted them silver. Then she used a black marker and a projector at school to trace the features of a quarter on each, heads on one and tails on the other. We used a Missouri quarter because it has the St. Louis Arch on the back of it. We dressed in all black with the quarters attached to the front of our shirts. We printed each half of the phrase on different sheets of paper, and attached them in sheet protectors to our backs. We probably looked pretty silly and they were really unprofessional costumes, but we couldn’t have been happier with them. We got people to take pictures of us in the hotel lobby and at the race. It was a great experience and one that we look forward to making an annual tradition. The only negative about it was that I injured my knee a few weeks beforehand, and ended up having to walk part of it and cross the finish line in a lot of pain. Even that ended up being a blessing, because my wife refused to run on ahead and leave my side. I kept telling her not to let me ruin the race for her, and she just kept saying, “We’re together.” She stayed with me every step of the way, and we joined hands for the last few steps as we crossed the finish line. Our times were not even close to competitive, but that didn’t matter. Everything about the race was symbolic of what had changed between us since getting back together. What had changed was everything. It continues to amaze me that my wife is so different now. When you’ve been with someone for more than a decade, you think you know everything about them. You assume that you know how they will react, and what they will do at any given time, but everything was new and different. It’s true that opposites do attract. My wife and I are very different from each other, but it takes the two sides to make the one coin. Ever since we moved to southwest Missouri, one of our favorite things to do has been the first friday art walk in downtown Springfield. The first friday evening of every month, the whole downtown square and surrounding areas are one big street party. The art galleries stay open, many businesses offer samples of finger foods, while some have wine to taste, and there is live music (some hired and scheduled performers and some street musicians) everywhere. It’s a lot of fun, and my wife and I have always loved the atmosphere. Sometimes we only go for a little while and other times we stay out and visit lots of places. We usually run into people we know, and sometimes we invite friends to meet up with us. When we still had the kids living at home, we would sometimes take them, and they always looked forward to it. The only drawback was figuring out how and when to make it time for just the two of us, and how much to share it with others. Over the years, we missed very few art walks. Occasionally we were out of town, or the weather was horrendous, but for most of the first five years, if it was first friday art walk, we were there. Last July, we were separated during art walk, and it occurred at a time when things were really pretty iffy in terms of our relationship. Where I stood was a huge question mark, and we were at a critical juncture in which way things were going to go. It seemed too much like a date for either of us to be totally comfortable going together, but we both wanted to go, and not by ourselves. My wife asked me to bring our Son, who was still staying with me at the time. He wasn’t able to go, and I ended up asking a buddy of mine, who was a friend of both of us, to come hang out. He knew what was going on, so he was also rather uncomfortable, but I assured him not to worry and that things would be very casual. We all met downtown at a cheese steak shop, and set out on foot after we ate. My wife seemed completely at ease and more and more open with me as the night went on. We held hands and laughed quite a bit together. We had a great time and I couldn’t help thinking, “Why in the world are we separated? We are obviously still a great couple and this is how it could be all the time.” I couldn’t understand why my wife didn’t see it, or what held her back from returning to me, but she still needed to go through some things before she came to that realization. After we got back together, it seemed like every first friday, there was something that interfered with us being able to go. The first one, my wife was sick. Several in a row were rained out. I often had to work at Macy’s on friday nights. For a while, it seemed like we would never be able to spend a romantic art walk as a couple in love again. We made a few brief appearances here and there, but it wasn’t until two months ago that we really got to enjoy a first friday. The weather was perfect, our schedules were clear, and there was nothing to stand in our way. This time, holding hands was as automatic as breathing. Laughing together is just what we do. And we didn’t need anyone else there to take the pressure off or keep us from feeling awkward. At one of the photography studios, they were giving out free samples of cake pops, made locally. Not only were they a tasty treat, but we decided they would be the perfect thing to serve at our renewal ceremony in August. It was just an extra little blessing that came out of the evening. Last month, we invited my friend Joe and his family over for dinner, and they went to art walk with us afterward. We also invited our friend who had gone with us last year while we were separated, but he was out of town. We ran into some other friends and people that we knew as the night went on, and it was really just a time to celebrate how good things are now. In just a few days, it will be the “one year later” art walk and, while we look forward to it as much as any other, our first fridays have already been restored. When you start working on a project in an older home, it almost always produces unexpected challenges. It doesn’t matter whether it’s a big job or a small one. If you think it’s going to take 30 minutes, it will probably end up being at least two hours. If you’re expecting to work a few hours, it may be a day or more. The older the house, the more this tends to hold true. The reasons are varied. Usually, it’s because once you start tearing into something, or taking something apart, you find out that the problems are worse than you expected. Very often, this is further complicated by the fact that the construction and the materials are so outdated, there is no easy fix. It’s not as simple as taking off a leaky faucet and replacing it with a new one. It turns out that the pipes are rusted out further down and the fittings don’t match what’s being made now, and it always seems to be Sunday evening when nothing is open to get parts anyway. At those times, decisions have to be made. Will you insist on the replacement parts being as genuine and authentic to the time period as possible? If so, what if they no longer meet building codes? If you can’t find suitable parts, will you attempt to weld and make your own? Are you willing to allow for updating and modernizing, and, if so, to what degree? In the case of our marriage, we had a good number of years under our belt when all the problems came to the surface. Many of these were long-standing issues that should have been dealt with as part of routine maintenance, or when they were small. They would have been much easier to fix. As it was, we got through the worst of it by last August, when we began living together again. Even so, the unexpected problems and issues kept popping up. Whenever it seemed like things were ready to go smooth and easy, something would always seem to arise that would make us have to stop and deal with it. There were times that we reached a high level of frustration and we both made statements like, “This is never going to go away,” or “This will never be over.” As much as we were trying to focus on the present and the future, the past kept creeping up and interfering with the work we were doing on our relationship. We shouldn’t have expected it to be easy, but we were still caught off guard by the idea that there was going to be more to this than we thought. As we’ve moved throughout this year of the restoration tour, we’ve experienced incredibly high highs and devastatingly low lows. The highs are better than anything we used to have in our marriage, and they allow us to see what is really possible when two people love each other the way God intended. The lows cause us to have to make those same kinds of decisions that come up in a house restoration when things don’t go according to plan. There are three things that I think need to be stated about the restoration tour. The first is this: No matter how difficult or frustrating it ever becomes, you don’t give up and walk away from the house. Ever. You have too much invested and you will never be able to be completely ok with letting go of that dream and that place you called home. You may have to re-think some things, it may take more time and money than you were hoping, and you may have to do things differently than you were planning, but you stay in the house and you do what you have to do. The second is this: There is little or no room for rigidity when it comes to restoring a marriage. You have to be willing to be flexible. You have to allow for the fact that time has passed, and things are constantly changing. No matter how good some of your past memories are, and no matter how much you want things to be just the way they were, that’s probably not going to be the case. You can’t get stuck in the past. You have to make some changes and embrace some newness. A relationship is a living, dynamic thing that doesn’t just stay still. Some things you may not be able to fix or replace, and you may just have to come up with something new where that used to be. The third is this: Restoring your past mistakes and hurts is not a make-believe game. It’s not playing dress up and acting like things are different from they are. It’s confronting those areas where you failed in the past and succeeding in the present. It’s finding those places where things weren’t built right or sustained damage and either re-doing the work so that it is right, or replacing what’s faulty with something newer and better. What you end up with may not look exactly like it did in the beginning. It also may not turn out to be what you thought it would when you started. If it’s done correctly, though, it will be stronger, more useful, and more in keeping with the times. It may very well also end up being more beautiful than it ever was before. Eureka Springs, Arkansas, is a discovery my wife and I made a few years ago. If you’ve been there, you already know what I mean. If you haven’t, you really need to go sometime. It’s just not the type of thing you can really explain. Stepping into Eureka Springs, especially the downtown shopping district, is like stepping into another world entirely. It’s an extraordinarily beautiful place that has a little bit of everything. It’s a bit reminiscent of the town that the characters in Harry Potter visit from time to time. It’s full of art galleries and places to eat and shop, and live music can be heard playing just about everywhere. Our first time there, we were just passing through town on the way home from somewhere. We were so intrigued that we soon went back. We instantly fell in love with the town, and it was the beginning of many great memories. It’s close enough that we can go anytime, and it’s perfect as a romantic getaway, or just an escape during busy or stressful times. Eureka Springs was where we went soon after I came clean about what had been going on in my life and the mistakes I had made. We booked a bed and breakfast up the hill from the shopping district. Our sole purpose was to have a make-up session for our marriage and I thought it had worked. We had an amazing time of renewing our relationship and I figured we were good to go from there. Of course, we weren’t in the long run, mainly because my heart just wasn’t ever in it like it had been. During the early days of our marriage problems, and before we actually separated, I kept holding onto the hope that things would just turn around and be ok. Everyday, I would convince myself that this day would be the breakthrough. I was sure that it was only a matter of time before my wife would let down the walls and let me back in to her heart. I knew that no matter what she said or believed, deep down inside she had to still love me. A love like ours doesn’t just disappear, but it does get lost or buried sometimes. One day, at the peak of all this tension, I asked her to go to Eureka Springs with me. I thought that if I could get her to the place where we had such wonderful associations, she would feel the love in her heart again. She agreed to go, and I put everything I had into trying to show her how much I wanted to be her man and win back her love. I was very encouraged that she let me hold her hand all throughout the day, but she wouldn’t let me any closer than that. She was wearing a dress (my favorite) that I had bought for her, and I took lots of pictures of her while we were there. In all of them, she had a sadness in her eyes that completely tore me up. Even though she looked so beautiful, there was an unmistakable distance that I couldn’t cross. We ate dinner at a restaurant on a hotel balcony, sat in the park listening to music, and I tried to be as romantic as possible, but to no avail. Yesterday, we went there again as part of the restoration tour. It was our first time back since that day, and it was one of the truly major tour destinations for us. It wasn’t that we had hurt each other there, or created any bad memories in Eureka Springs that we needed to fix. It was just the feelings of having been there during that time when we weren’t close, and a few regrettable statements that my wife had made during our separation that had gotten back to me that hurt. It was important that we go back there as a renewed couple, full of love for one another, and with no doubt as to where we stood. We needed to reclaim Eureka Springs as our special place, with no competing thoughts or memories to drag us down or cause regrets. It’s was a beautiful time spent together, and it reaffirmed what we always knew. That us being together in that place is one of our treasures, and one we intend to keep forever. Probably the biggest surprise for me of our restoration and reconciliation was the way my thoughts and emotions would sneak up and throw me for a loop at the most unexpected times. There was the initial newness and bliss of being together again that was so amazing, and I wouldn’t trade it for anything. Then there was the completely unforseen dynamic of me becoming very angry or sad because of everything that had happened. I suppose it was extremely naive and unrealistic to think that we could go through everything we did and that I would just be able to put it all in the rear view mirror and go happily forward. It seemed like it at first. There were the fears and doubts that plagued the first couple of weeks of being back together, but those mostly amounted to opportunities for each of us to reassure the other of our love and commitment. Still, I didn’t expect things to get worse after they had been so good. I don’t know if I just pushed things down and ignored them and it was only a matter of time before they came back up, or if it was more that I was initially so filled with gratitude and relief that I really didn’t think about any residual effects from our time apart. I finished up my therapy about a month after my wife and I reunited, based on my doctor’s opinion that I no longer needed to make regular visits. He left the door open for me to return at any time and, as the months went by, there were numerous times that I seriously considered it. I know just enough psychology to understand the way I’m wired, and my emotions are very much tied to specific events. These “events” can be as major as the day my wife moved out, or as minor as a casual statement that she made that struck me wrong. I tend to have triggers like certain days of the month that correspond to painful memories, or visual reminders of past hurts. For a while, life began to be a maze where I had to try to navigate without getting caught by any of those reminders. Fairly quickly, I realized that it was not only unhealthy, but a form of running away to live like that. My wife also was carrying burdens that she needed to be able to release, and I needed to be strong enough to let her give them to me and help her to heal and be free. This is where the need for complete trust and honest communication became so critical. We each had to trust the other’s love enough to be able to open up and talk about the things we were having trouble with. We needed to know that even if these conversations were painful, they were necessary to produce healing for us. Unfortunately, the more I knew, the more I had to heal from. I decided at the beginning of this summer, it was time to make sure any remaining issues, no matter how small or insignificant, were taken care of. I still hd a few questions and there were a few things that still bothered me. I wanted us to reach our ceremony and our honeymoon in August completely healed and free from any guilt or hurt. The truth is, as much as we may not want to talk about these things, the healing comes when we express them and are assured once again, of each other’s steadfast and continuing love. In just the last few days, my wife and I have both had little things unexpectedly creep up and surprise us. For her, it actually occurred while reading this blog. For me, a series of events over the last couple of days took me back too much to a place I didn’t want to be. Just this morning, I ended up expressing that I was still a little bit angry with my wife over some deception regarding her state of mind before we separated. It was triggered by three or four things that I still had some painful associations with, and I realized that it wasn’t just going to go away. That’s really what the restoration tour is all about. It’s about identifying those memories that have been corrupted by gaps in our love, commitment, and faithfulness, and revisiting them. Not to rehash the hurts, but to replace them with new, better memories. We are taking back what used to be ours and claiming those things for us that hadn’t been ours before. Today, the restoration tour took us by bicycle to the Wilson’s Creek National Battlefield. It’s a historical site of a civil war battle that has, in a roundabout way, played a role in our lives ever since we moved to Missouri. Our first house in Missouri was located on about 80 acres that the landlord ran cattle on. Just to the north was the Wilson’s Creek Battlefield. If you walked straight out our back door, you would come to the boundary of the battlefield, where Terrell Creek merges with Wilson’s Creek. That was the house that was destroyed by the tornado on March 12, 2006. The history and effects of that tornado have already been documented in this blog, but that event was the single biggest factor in the changes in myself that led to the downfall of our marriage. The fact that the battlefield was there was incidental, but it did provide the backdrop for many good hours of fishing, hunting, and exploring before the tornado. When we moved back to Republic in 2007, we always talked about going out to the battlefield some day, but we never did. Then, last Spring, my wife got into cycling right about the same time we were splitting up. We also got interested in becoming triathletes and we heard that the trail through the Wilson’s Creek Battlefield was a good place to train because of the hills and conditions. I got my wife her first road bike for her birthday that year, and I also bought her a pink cycling jersey. This was during the time that we still lived together, but that she no longer thought that she loved me, and things were already in motion to break us apart. I took her and her bike out to the battlefield so that she could ride the trails while our son and I ran. We took pictures of her with her bike and her jersey and I tried to be happy for her despite the circumstances. About a month later, she bought a new bike and moved out. We only went out to the battlefield a few times together, and I went several times by myself after that. I still have those pictures, and they’ve always made me kind of sad because of the memories they invoke. Since we’ve been back together, cycling and fitness have been, once again, a big part of our lives. We both have nice road bikes now, and during the summer, we practically live at the gym or out on the many trails near our home. During the school year, it’s not uncommon for us to cycle the 18 miles to work. This August, on the day of our renewal ceremony, we plan to spend the morning riding the 62 mile Tour De Cox. Just recently, after much indecision, my wife decided that she does want to compete in the Tiger Tri this August. Since we really do need to step up our training, we decided that this morning, we would ride out to the battlefield, do some running once we get there, and ride back. This led to a comedy of errors, thanks to the navigator on our phones and some unmarked country roads that we may or may not have been supposed to have taken. We did eventually reach the battlefield, and as we rode into the parking lot where we used to unload bikes from the back of the car, I realized that my wife was wearing that same pink jersey from more than a year before. I hadn’t intended today to be a restoration tour stop. I just thought it was going to be a long ride and brick workout, but when I saw where we were and the memories came flooding back, I realized that this was a part of our restoration just as much as the planned stops. Sometimes that’s the way restoration works. Sometimes you’re just doing work that needs done, and you discover something you didn’t expect. It could be a color of paint underneath that shows up while scraping. It could be a discovery of something that was built over, but is still there and can be incorporated back into being part of the house again. The great thing is, those discoveries happen, and then you get to choose what to do with them. Whether it’s a house, a life, or a marriage that’s being restored, it will almost always end up being a combination of the things you planned to do and the things you discover along the way.